If you are considering changing firms or practice status during the year, note that any return of premium arising under the policy is made payable to the original payor, unless otherwise requested by you and the original payor in writing. 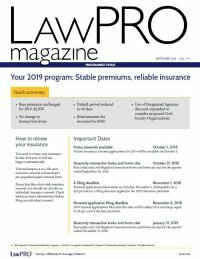 Please advise LAWPRO promptly in writing, of any such change in firm or practice status, as the return of paid premiums shall be limited to that relating to the 30-day period immediately preceding LAWPRO’s receipt of your written notice, and any subsequent period thereafter. Regretfully, for those policies carrying the Real Estate Practice Coverage option, we are not able to backdate any refund of paid premiums due to exemption.